The play, Nina Simone: Four Women is a play about singer, songwriter, activist, Nina Simone, whose music spanned many genres of American music, classical, jazz, blues, folk, gospel and popular. The play is conceived from Nina Simone’s song, Four Women, that is about four different Black women in American society. The play contains several of her famous songs, standards, and originals, that are performed throughout, by the four actresses, especially, Sydney Charles, in the lead role of Nina. All four are excellent singers and actors. Each of the “four women” has a different body shape skin tone, personality, perspective, and social position." Sephronia” is light-skinned, mixed, high-class lady, Aunt Sarah, is a plain, working-class, med brown-skinned “domestic’, “Sweet Thang” is a “streetwalker”, flamboyant, outspoken, no-nonsense, somewhat violent character, and “Nina Simone, is a dark-skinned, artistic, independent, “feminist” and political activist. All women characters’ lives interact due to their conflicting lifestyles and attitudes that are part of the Civil Rights era but are just as prevalent today. The only male character is the piano player, who has little dialogue. The play, I would say is “woman-centric” as it focuses on Nina Simone, as an independent artist and woman, who is attacked verbally for being an artist and in charge of her own life. 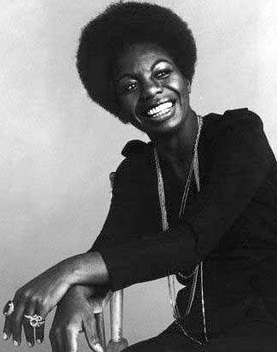 The songs chosen for the play are ones from Nina’s repertoire that represent that independent spirit as well as the Civil Rights Movement and include, “Old Jim Crow’, Mississippi Goddam”, “Young, Gifted. And Black”, Porgy, “Brown Baby (Oscar Brown Jr song) and my favorite, “Four Women”, that this play is based on. My only criticism is that I feel the dialogue should have been a bit less and more great songs by Nina and company could have been added. The dialogue was lively, spirited and imaginative, and kept my interest throughout the play, set in 1960’s Birmingham, Alabama.